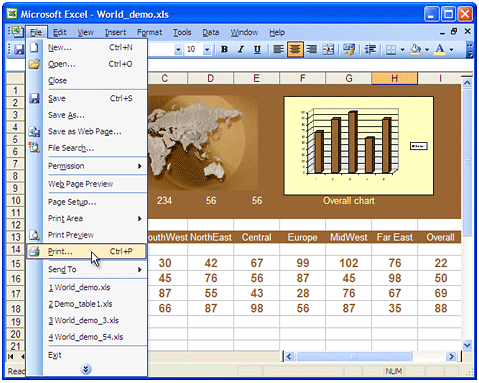 Files created by the program Microsoft Excel are often complex in structure. For example, summary tables may contain links to data from several Excel files located in the "My Documents" folder. Having converted tables and diagrams from Excel to PDF, you receive "frozen copies" of these documents that are independent from the other files with data. The obtained PDF files can be sent to the client by e-mail, published on a site, or used as an illustration for a blog. Universal Document Converter is the most complete solution for the conversion of documents into Adobe PDF or graphical files. The underlying basis of Universal Document Converter is the technology of virtual printing. As a result, exporting Excel to PDF format is not any more complicated than printing on a desktop printer. Open the Excel file in Microsoft Excel and select File->Print... in the application main menu. 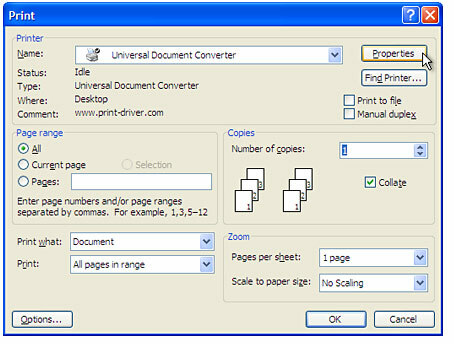 Select Universal Document Converter from the printers list and click Properties button. Use the Open dialog to select "Worksheet to PDF.xml" and click Open. Click OK in Microsoft Excel Print dialog to start converting. 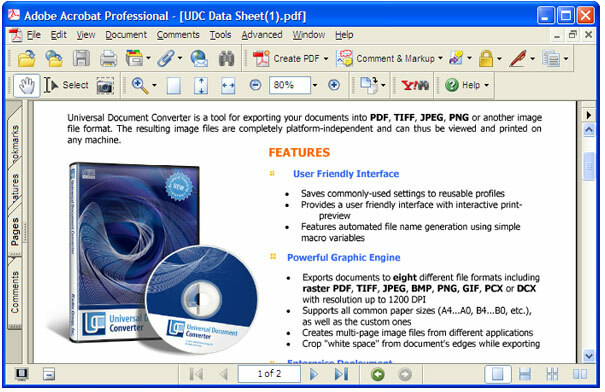 When the PDF file is ready, it will be saved to the My Documents\UDC Output Files folder by default. Converted document will then be opened in Adobe Acrobat or another viewer associated with PDF files on your computer. Print Conductor is a software for printing documents in batch mode. Just select Universal Document Converter in Print Conductor list of printers - and you will be able to convert a number of Excel Worksheets (*.XLS and *.XLSX) to PDF automatically. Q1: How do I append several tables and diagrams from different Excel files to one multipage PDF? A1: Please open the Output tab in the Printing Preferences window. Select Append all pages to existing PDF file in the Options drop down in the bottom part of the window. Q2: I need to automate the conversion of documents myself using VB.NET. Do you have any examples? A2: Yes, you can find source code examples for Visual Basic and Visual C++ in the Developer Solutions section of Universal Document Converter's site. Q3: I need to convert a black and white table from Excel to PDF format. How can I reduce the size of the PDF file? A3: Please use the Table to PDF, Black&White profile in step 4 in the instructions above.